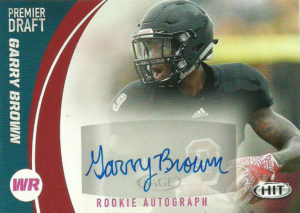 Garry Brown is an intriguing prospect out of little known football school University of California, Pennsylvania. Garry brings a lot of intangibles to the table. He’s a competitive student of the game, with a lot of potential, willingness to learn, and special teams experience. While playing for the Vulcans, Garry paced wide receivers at all NCAA levels in scoring, averaging 13 points per contest, and averaging 4th in the nation with 184.9 all-purpose yards. His 2106 stats were truly astounding as he piled up 91 receptions for 1,475 yards and 22 TDs. At the conclusion of the year, he earned was the Harlon Hill Trophy- the D2 equivalent of the Heisman Trophy. While he posted some truly outstanding numbers, he faced stiff competition from a very competitive WR field in 2017. Considered a 7th round pick or a high priority free agent, he signed after the draft with the Oakland Raiders. After he was cut he joined the Winnipeg Blue Bombers’ practice squad, and then in 2018 signed with the Ottawa Redblacks. Currently he’s a free agent.